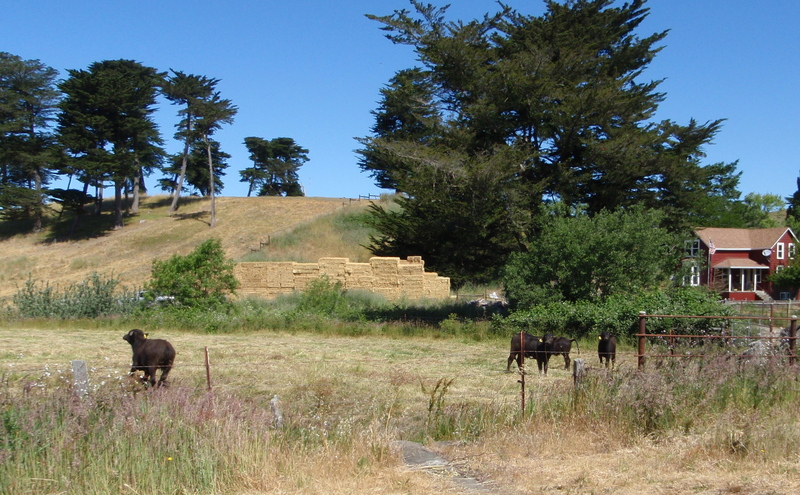 MALT=Marin Agricultural Land Trust I give money to MALT every month for purely selfish reasons; I love riding the the roads through the farmland of Marin county and I want to do it for a long as I am physically able. According to its website, “MALT has permanently protected nearly half of the farmland in the country, ” and is working to preserve more. 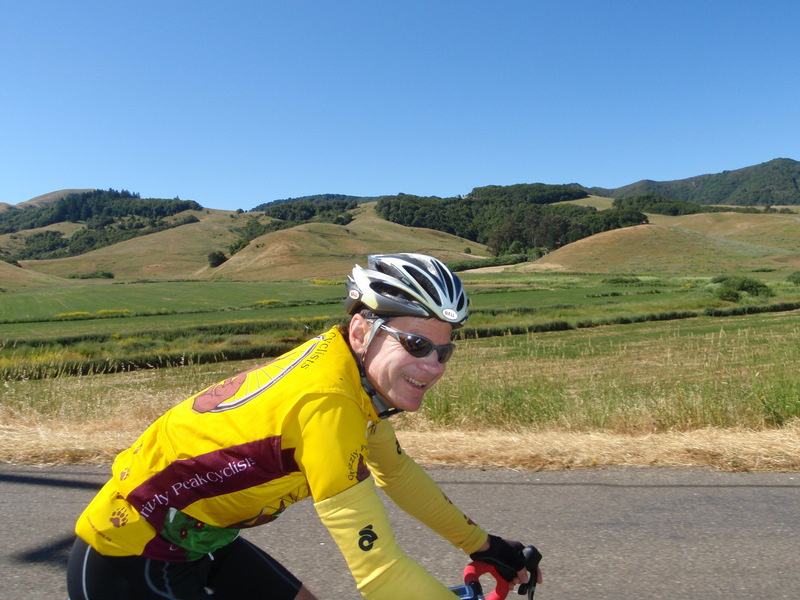 As a fund raiser, MALT threw a biking/eating event on Black Mountain Ranch. The biking was good, the food was good, and everyone had a great time. 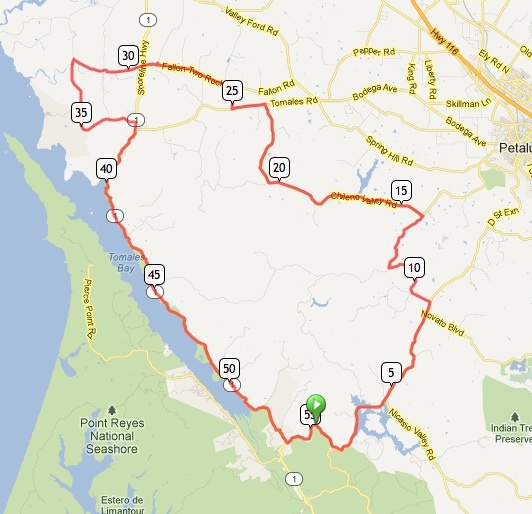 Route for Beer, Beef, and Biking 55 miles, long version. 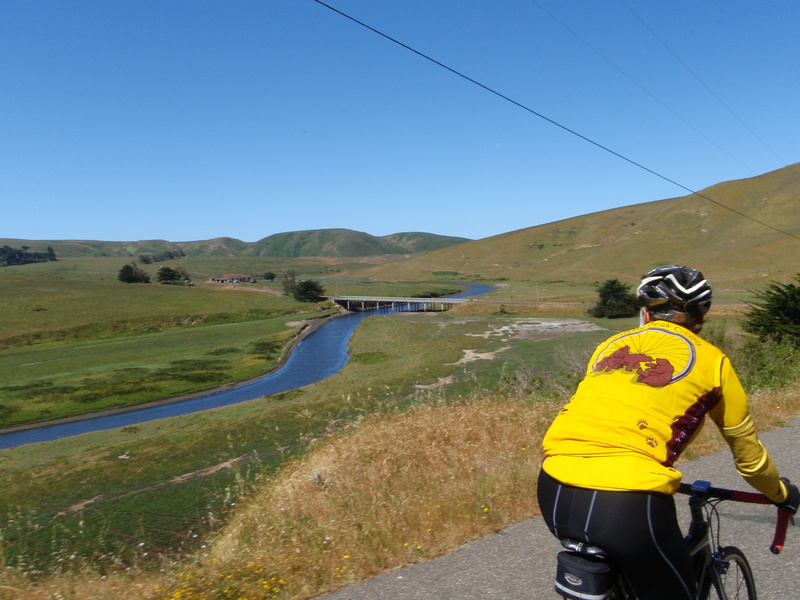 Ended and started on Black Mountain Ranch on Point Reyes-Petaluma road between Pt Reyes and the painted bridge. Route went counterclockwise. The ride started at 0845 and was 55 miles long with two significant climbs: Wilson hill and Franklin School. Franklin School can easily be replaced with Middle if we ran short on time. MarkN was very concerned about time. The lunch was being held from 12 to 1400 and he was told that if we missed the 14oo cut, we would miss lunch. He had also been told that last year they had run out of food and not everyone had gotten lunch. MarkN had been looking forward to this lunch for weeks and did not want to miss it. We would have to make any adjustments needed in order to get back in time. I had a 20 dollar bill in my jersey pocket and felt like I was good. I could always buy lunch elsewhere. Mark was having none of that, so we left early at 0830. Water Buffalo! Young versions. Way cute. I had never seen the water buffalo before. The Duros West crew mention them a lot. Mostly they talk about the shock of discovering that Buffalo Mozzarella come from milk from water buffalo and not from regular cows. MarkN is not quite sure that he is willing to eat buffalo mozzarella now that he knows. They then go on to discuss the ranch with the water buffalo and how long it would take to make such an operation viable. Since no one in this group has any experience or knowledge in this area, this discussion can go on for a while. The water bufallo are on a farm at the corner of Gericke and Fallon-Two Rock. I like Gericke road, but you have to watch out not to hit the peacocks hanging out in the road on the descent. I mostly like Gericke road, because no one knows how to pronounce its name and every ride that includes this road also includes long conversations about its pronunciation possibilities. We can then have the opprotunity to discuss other pronunciations such as Nicasio, Sobrante, Suison, Tomales, and Linux. Whitaker, Middle, and Franklin School are so pretty they verge on the absurd. 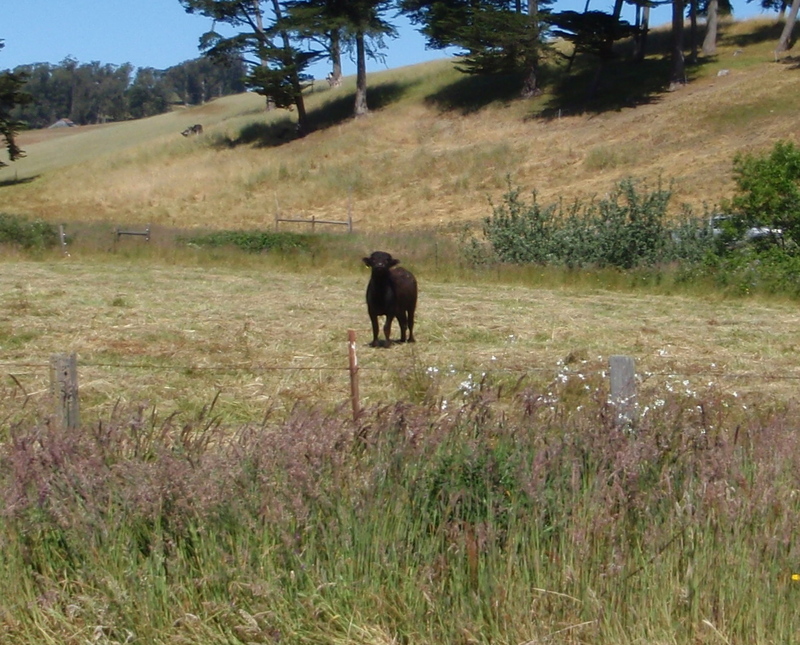 Sometimes the fields are also teaming with livestock. Today, we saw mostly sheep. I took a silly number of pictures of this stream, this bridge, and the surrounding hills. I am demonstrating considerable restraint by posting only these photos. Onto Franklin School Road. I spent much of yesterday’s ride referring to this road as Schoolhouse Road, until MarkN couldn’t stand it anymore and told me the correct name. We are on the bridge featured in the previous picture. 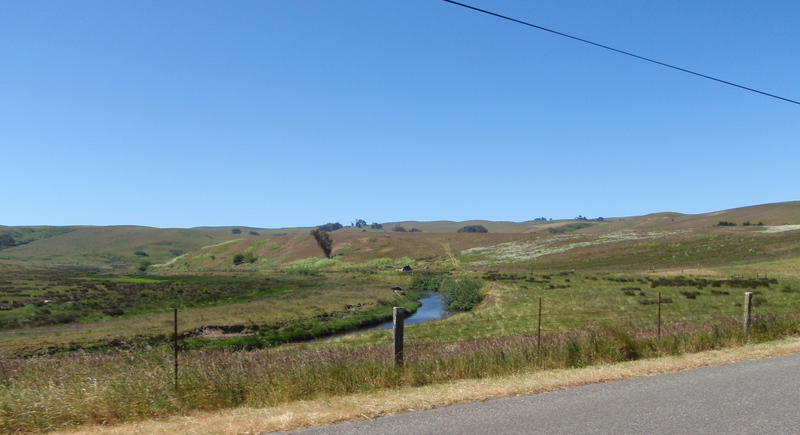 View from Dillon Beach Road and Franklin School Road. 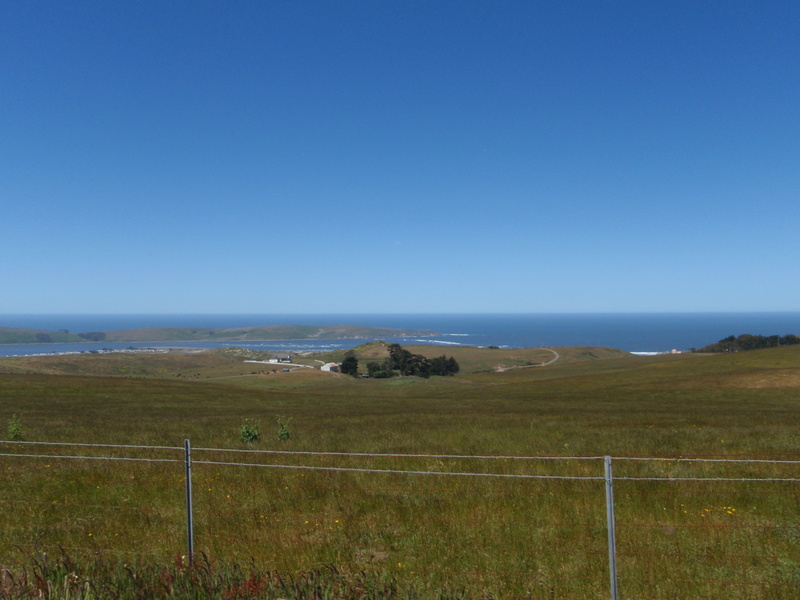 Mouth of the Tomales Bay. 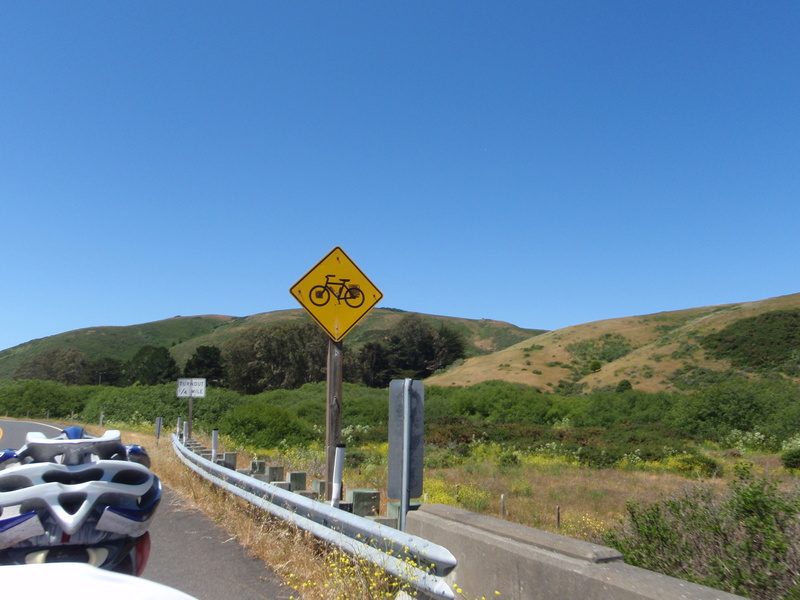 Dillon beach, Tomales Bay and then Pierce Point. We got back at 1215, just after the start of the picnic. Our initial worries regarding the time had been in vain. The food at the ranch was super yummy. 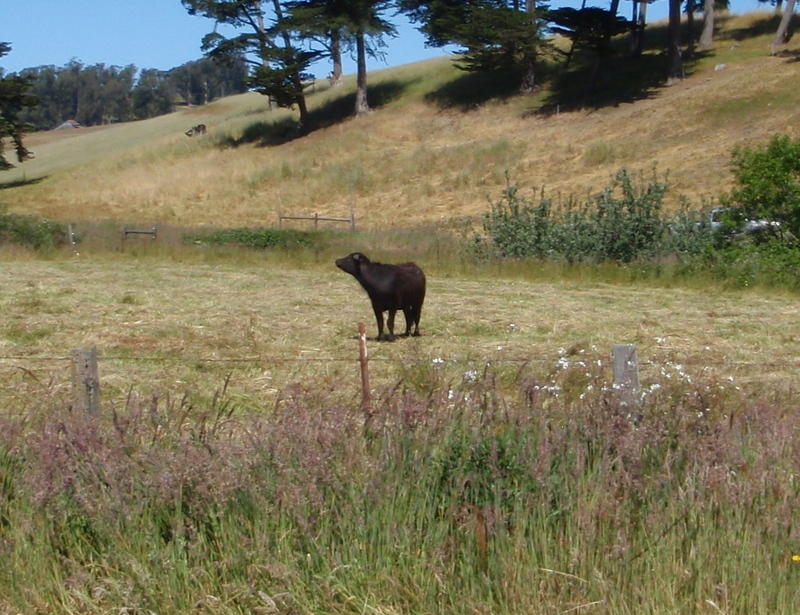 The owner tried to sell us on the idea of buying a cow, or half a cow, or a quater of a cow. A quarter of a cow yields about 100 pounds of beef, which would take Jason and I about 4 years to eat, but only if we dramatically increased our beef consumption. We would also need to buy a freezer. I only yelled 3 times, which is pretty good for a tandem ride. I am wary of riding the tandem around MarkN. MarkN and I have ridden the tandem together a couple of times and I am afraid that if I get too angry or scared while riding the tandem with Jason, Mark will stop riding the tandem with me, deciding that I am too much of a pill. I am not the world’s best stoker. My husband, who rarely yells back, however, may be one of the world’s best captains. Jason and I rode the tandem. We rode with MarkN. Jaz did the shorter route, which went over Marshall Wall and then came down the coast. MarkS did the long route.